Bikes 4 Life is honoured to be a part of the 25,000 Spins Great Ocean Road Charity Bike Ride again in 2017, after a hugely successful and amazing event in 2016! The Great Ocean cycle tour to help kids in poverty. Our three day cycling tour begins in Geelong Victoria. The Great Ocean Road is world renown for its dramatic seascapes and beautiful bushland with cascading waterfalls, and stunning rain forest. Ancient trees on one side and on the sea side magnificent surf beaches, high cliffs and incredible rugged coastal scenery and landscapes. 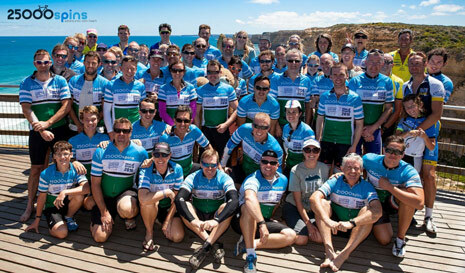 Riders on the Great Ocean Road during last years 25,000 Spins charity event! Please join our team of cyclists and help raise much needed funds for BIKES 4 LIFE, while also having an adventure of a lifetime! Fitness Level: The tour caters to all levels of cyclists.There will be a slow, medium and fast groups. 2. Food. Breakfast and lunch. Lunch on day 3 not included. 3. One way train ticket. Warnambool to Melbourne. 4. Bike repair. A mechanic will be on the trip. 5. A support van which carries your bags and are there to help and offer support during the ride. 6. Great Ocean tour guide. It is a condition of joining our trips that you must be adequately insured. All persons are expected to arrange their own travel insurance. All of the time you will have the security of a back-up vehicle. The vehicle will carry our entire luggage (we transport your main baggage by support vehicle from each overnight stop to the next). The back up van will be with us throughout the day stopping around every 15 miles. Our leaders carry a good tool kit and will help to fix any bike problems so all you normally need to carry is a daypack, for your camera etc, however, we cannot guarantee that we will be equipped for all repairs, so you must ensure that your bike is in good working order before the tour. If in doubt, have it fully serviced by a bike shop before you travel. At 25000spins we pride ourselves on running professional trips at unbeatable value. Our core reason for running these cycle trips is to maximise the funds that actually reach the field and help people in need. The deposit amount you pay as a cyclists doesn’t fully cover the trip and event costs. For the first three years of operation 25000spins covered the balance of these trip costs. However as we expanded the number of trips offered and the number of people joining increased this was no longer sustainable. We invoice the balance (Trip costs – your deposit) of the trip costs back to the charity only when you successfully fundraise. If you don’t fundraise we don’t invoice the charity any money. We keep our trip costs as low as possible without impacting on your safety and enjoyment. Absolutely! This trip is a fantastic challenge for anyone wanting to do something amazing for a great cause. There will be lots of like minded people on the trip all looking for the challenge of a lifetime and of course to meet new friends. Some people come with friends or family.Places are strictly limited so to avoid disappointment apply to join today. We will be cycling as a group so you must be comfortable with group riding. The tour caters to the keen weekend cyclists. Riding in either the fast or slower groups depending on your experience and fitness. 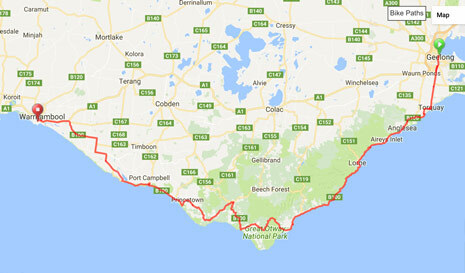 There will be support vans their all the way to help you reach your goal of cycling the Great Ocean rd. Is there a minimum to be raised? A minimum of $1,250 needs to be raised to join the trip. What if I don’t raise the minimum of $1,250. Can I still go on the trip? offers as much support as possible to avoid this situation happening.